Asparagus is in it’s prime right now! All of the little farms in the outskirts of our area have signs up selling it and my son and I even went to a u-pick last week. I’m dying to post some asparagus recipes and started a post yesterday about “Canning Pickled Asparagus” but I can’t post it because I actually haven’t tried it yet (I like to let it sit for a few weeks before I open it). 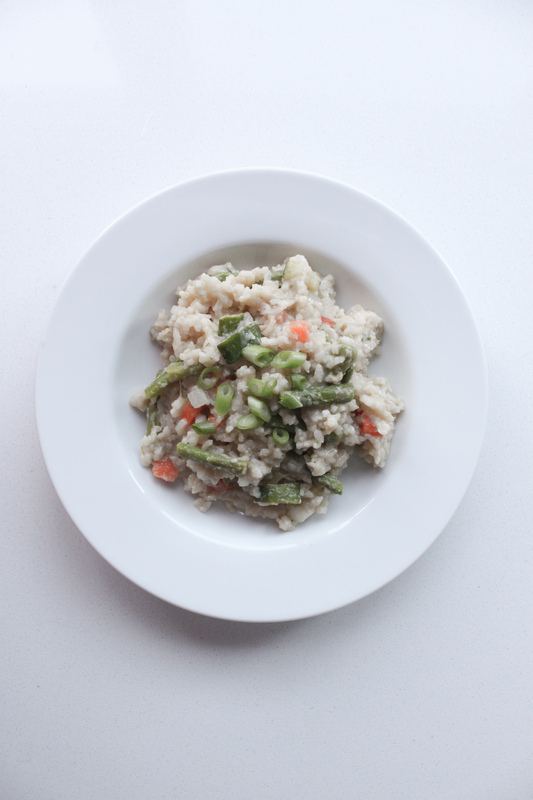 Something I can post, this gluten free, dairy free, soy free, nut free spring vegetable risotto, which features….you guessed it, asparagus! This is the first and only risotto I’ve ever made and it turns out perfect every time I make it! It happens to be on the menu this evening because we just got home from Northern Michigan (Charlevoix to be exact), I’m craving whitefish (which I’m defrosting) and this pairs perfectly with it! I also happen to have the trimmed ends of all of the asparagus that I had to cut down to fit into the canning jars when I made the pickled asparagus last week. I found on the back of a Whole Foods vegetable broth carton a few years ago. Like most recipes, it’s modified pretty substantially to suit our tastes, and our dietary needs – meaning it’s gluten free, dairy free, soy free, legume free and nut free. It’s so rare, once you eliminate dairy, to find a creamy side dish. 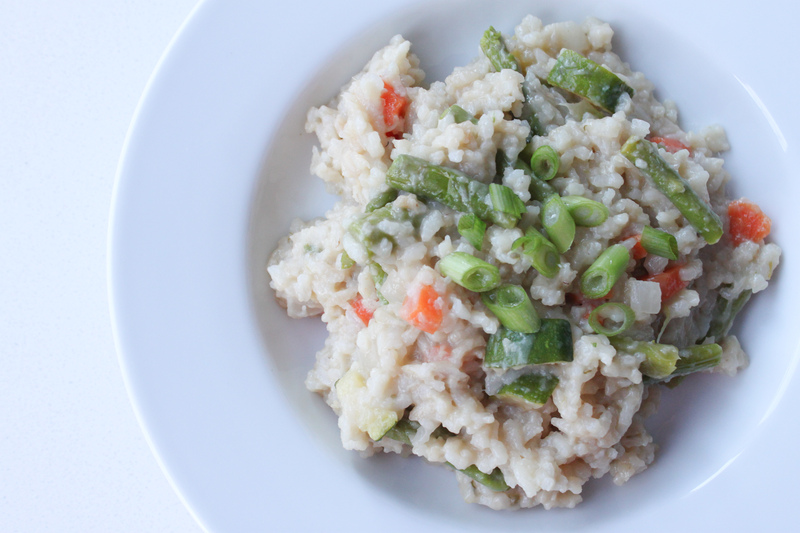 This risotto is just that (my mom didn’t believe it was dairy free)! Mix the broth and water in a medium pot and bring to a boil. Add asparagus and simmer for about 2 minutes, until just tender. Remove asparagus with a slotted spoon and place in ice water bath to cool, then drain and set aside. Cover the broth/water mixture and bring back to a simmer. In a skillet, heat oil over medium heat. Add onion and stir occassionally until softened. Add garlic and saute for 30 seconds. Add rice and cook, stirring gently until it is toasted, about 4 or 5 minutes. Add 1 cup of the broth and cook, stirring constantly. Make sure to adjust the heat to keep the liquid at a constant simmer. When liquid is almost all absorbed, repeat the process adding 1/2 cup of the liquid. Continue to do this until the rice is just beginning to get tender (about 20-25 minutes), then add carrots. Continue to process with broth/water mixture until the carrots are tender. Then add zuchinni. Process for 5 more minutes (if your broth is getting low at any point just add some more water but make sure it's fully heated before adding it to your rice). 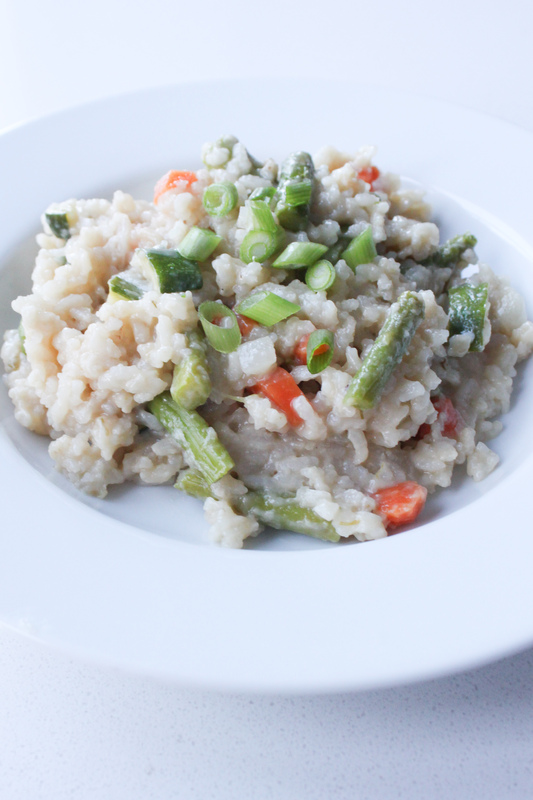 Once the rice is tender, stir in the asparagus and cook it until its thoroughly warmed. Add butter (or Earth Balance), salt and pepper to taste. If you want, stir in some fresh dill weed (I like to add this if we're eating our risotto with fish). Delicious and healthy satisfying meal! Love using Michigan home grown produce in your recipes!